It was great to hear that we were off for a ‘run’ for a change at run club this evening rather than bashing out intervals or sprints in the park. We went ‘undercover’, removing our bibs (most of us then, because of the heat, had to replace our tops!) and headed out of he confines of Hyde Park. A lovely change and despite the heat a fantastic evening to be running the streets of London, its parks, past landmarks, dodging tourists and appreciating living in such a wonderful capital city. We ran fartlek. The 80% effort down Constitution hill was great, the 80% back up on the way back less so and my 90% effort was short-lived! As usual I put my foot down at the start of each segment of effort not knowing how long it was going to last and ended up hanging out unable to keep up pace so the recovery parts were very welcome. Note to self; you have neglected your long runs for too long. Endurance has gone to pot! Juneathon day 6. 5.26 miles of fartleks, 47.12 mins. Categories: Juneathon, running | Tags: British Military Fitness, Fartleks, Juneathon, London, Running | Permalink. Fartleks I think are the most fun you can have running! 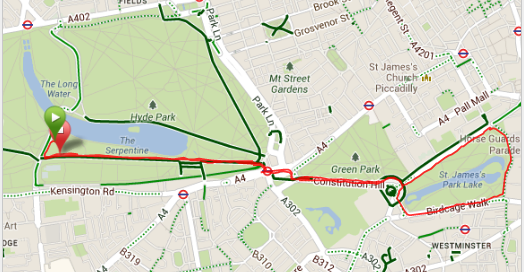 Who do you run with in Hyde Park? Fartleks are definitely fun in a group! The run club is one of the sessions offered by BMF. Shall we swap? I’ll take a bit of your speed and give you a spot of endurance in return?